It looks fabulous Jimmy I like how the paw print stone is different it goes well with the fountain, like it's a part of the fountain and not the rest of the stones. Kind of a symbolic thing since the fountain really pertains to Anuscka and Malukhai and their prints lead up to it. LOVES IT!! Thank you Renee...it was actually planned that way (really, it was!! LOLOL) I coulda bought a dye/coloring additive for the cement that woulda blended with the other stones better, but I wanted this "stone" to be part of the fountain itslf. 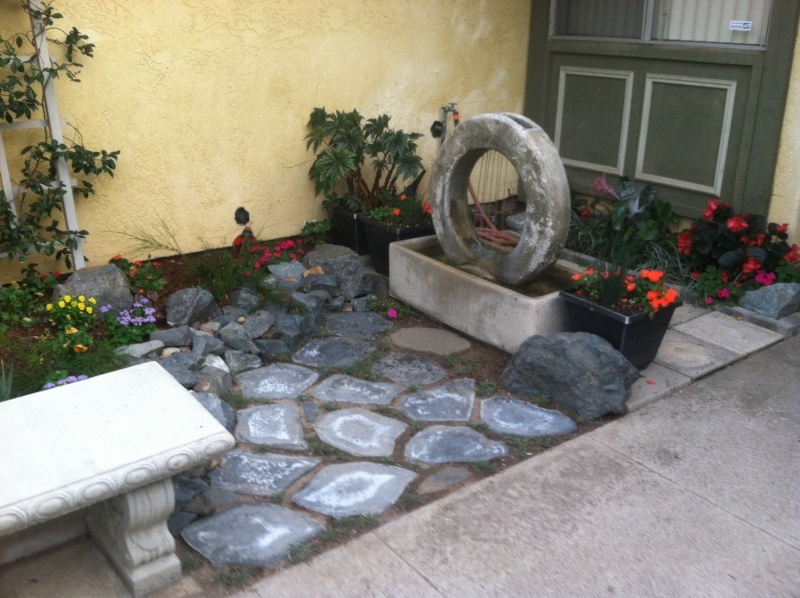 Theres still a bare spot (cuz Kohdi steps on and kills the flowers there), haha, so I may put another blue/grey stone there which I think will finish it properly. Look amazing Jimmy! The paw prints are a great addition. 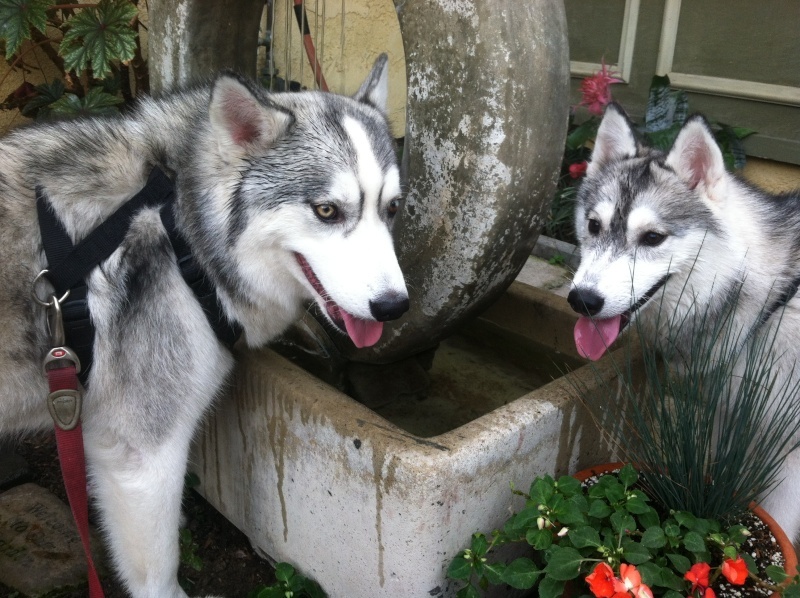 I'm happy to also see that you got a couple pictures of Kohdi and Mishka together! How do they enjoy their new fountain area? They were my pride and joy...and I miss them so much. 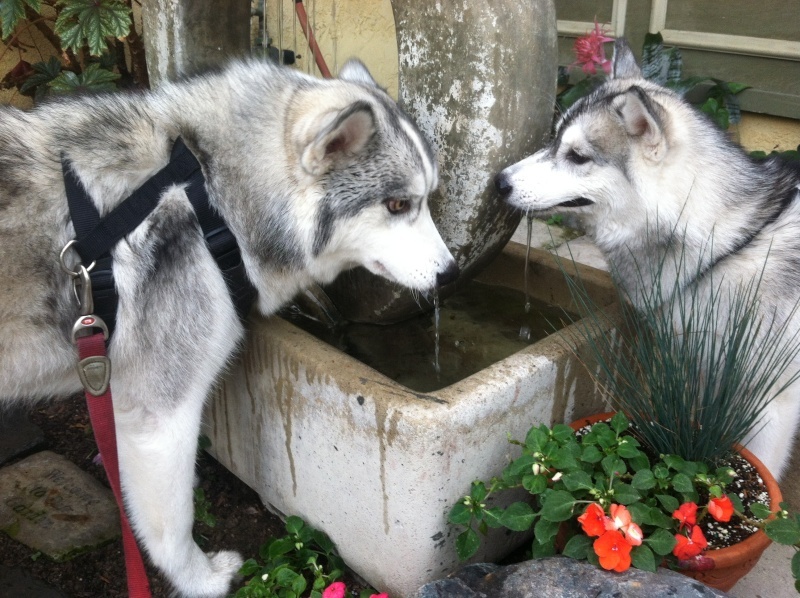 The fountain is "unique", haha...it sounds really nice and the way the water falls is actually very peaceful though...it has some great memories and Kohdi and Mishka are giving me more...huskies and water, they love it!! Your welcome! I'm sorry, you must miss them terribly..but that's a great way to remember them Hey, unique in a GOOD way! All your pups are gorgeous your a lucky guy! I do miss them very much, I probly always will, but doing this project has actually helped me somehow...its just a landscaped area but the fountain has memories (Malukhai had a blast with this thing...instead of jumping ovr a small hedge the people had around it, he'd just bust right thru it each time and dunk his entire head in the water when he drank, then he'd get everybody wet, etc.) 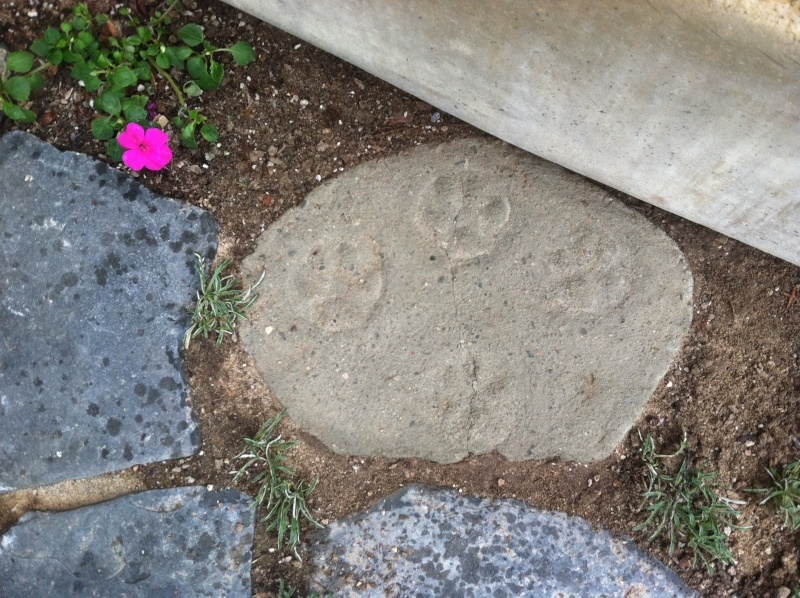 having their paw prints in front of it has given me some sort of closure, can't really explain it but it has. And...I thank you. I do realize I'm VERY fortunate, not only for the two I had, but for the two I have now. Hahaha, I like the fountain, however, when I see it (design wise) I see a car tire, lol. Its funny too cuz the people who gave it to me told me they chose it cuz it has this whole "Zen" thing going on, she's describing that and I remember just looking at her and thinking to myself "REALLY?? like seriously, REALLY?!!! its a car tire!!" hahaha, but...the way the water comes down in a little "screen" of lines of water gives it a very peaceful feeling about it...and yet from my bedroom, it sounds like I'm nxt to a full-blown waterfall!! haha...and the way all my dogs love/have loved it, theres just something about it that makes me see that maybe she was right and it really does have this "Zen" thing going on Theres even a frog that has taken up residence in it, LOL. Ahhh, froggy, he's so cute. He's hiding Jimmy, no worries, haha. The zen thing, I like it, it makes sense. 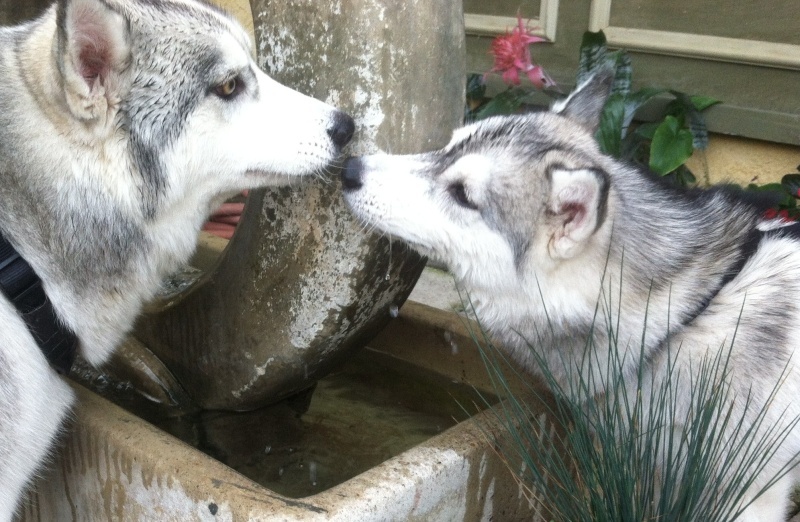 Love the pics of Kohdi and Mishka!! Awesome pictures Jimmy! I'm so happy for you! Kohdi does have golden eyes!Does he have a license to kill too? Okay I'll stop being a dork now. I think the frog is the perfect touch. Hopefully he pops back up. I'm actually hoping the frog is gone, haha...seriously!! 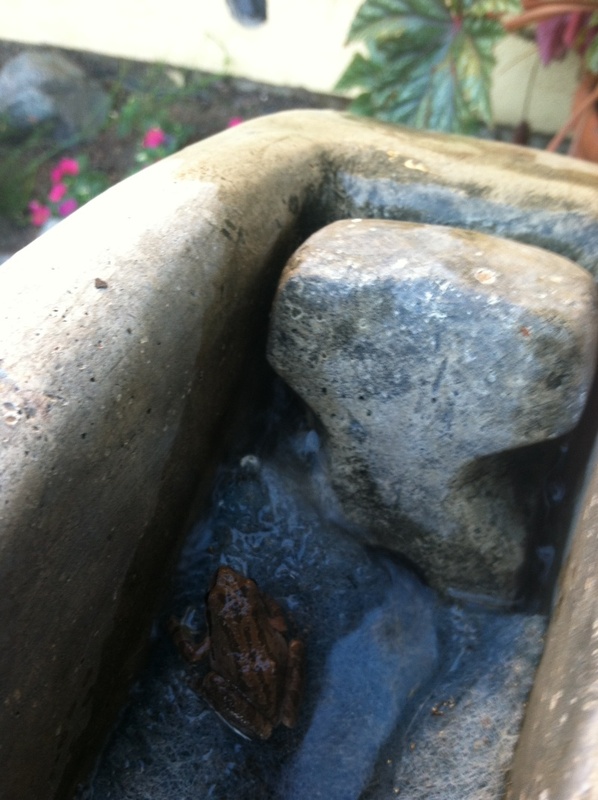 in the summers theres one that hangs out behind my pool and OMG is it annoying, that croaking ALL NITE LONG!!! I actually went looking for it one night, in the dark...and everytime I got to the spot I thought the sound was coming from, it'd be coming from an entirely different area, so I'd go there...this went on for awhile, lol...I was determined!! but never did find it. That is stunning. I love spring and all the things that pop up and bloom. I'm still waiting to see what of mine survived the winter here. Thank you Jenn last year there were only 4 blooms and this year it wasn't looking that good for any blooms (California is in a drought so we can't water too much) and then all of a sudden it looked like this! And I know what you're saying, even though we don't get snow where I live, we had a couple of cold snaps and I lost a few plants...2 of them were in the actual fountain area which kinda bummed me. I hope you come out ok! And take pics! Lol, I would love this thread to be more popular, gardening is one of my favorite things to do. I am forming a love for gardening but am really new to it. My mom and grandma always have tons of plants so I grew up around it. The house we bought already had a lot of established plants so I haven't gotten to do much of my own thing with out yard. Old owners made poor placement decisions with many of the plants and now that they are maturing to their full size I am seeing a lot of crowding issues that is a bit over my head. Seems like some of the plants we like the most like to die off on us. I have a flowering almond that I think is going the way of your Coreopsis. The coreopsis - several of them these days are touted as "perennial" but really are not reliably. Do come back from seed. 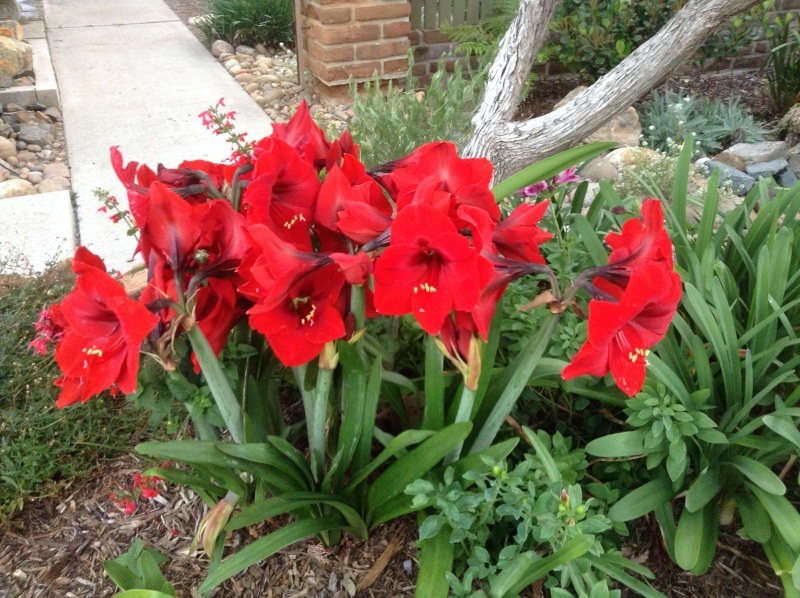 Jimmy - much to my surprise all 3 of my amaryllis bulbs gave me a stem of 4 flowers this year. After flowering, I fertilize it every watering with half strength water soluble 20-20-20, give it lots of sun throught the summer, start withholding water in Sept, let the leaves die off and go dormant until Jan then bring it out, put it in light and water. I have transplanted and moved all kinds of stuff. Now I'm left with the really big stuff that isn't so easy to move. I have a burning bush and a flowering almond both planted right under a bradford pear. 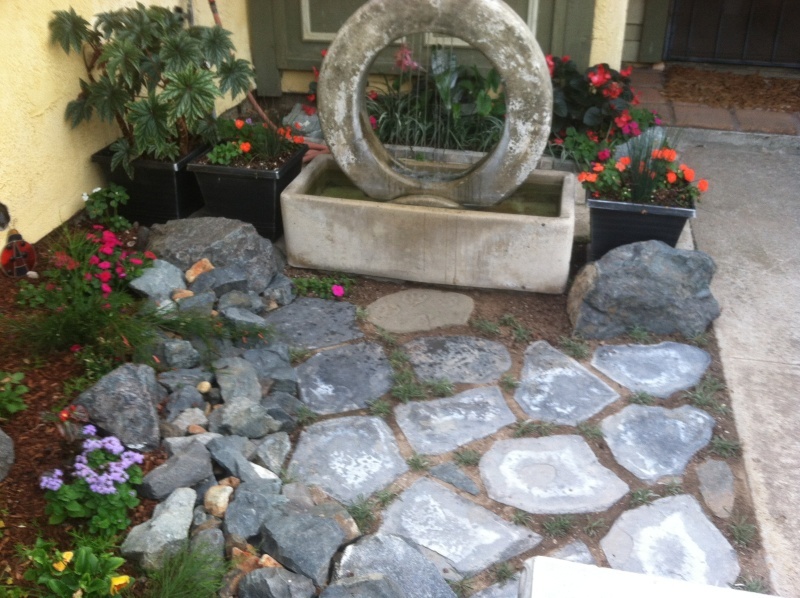 And right in the middle of all that they put a rose, a rock, and some hyacinth. I fear trying to rip the burning bush or the almond out will hurt the pear at this point. All have been allowed to get massive. I do think I am going to dig the rose out this next season though. It will be the easiest to start with. For the burning bush - you could severely prune it and keep it small. Or, do a 2-year transplant process to get a compact rootball. Slice a half-circle around 1 side of the plant - it will put out new feeder roots inside the half-circle this year (and the Bradford pear will also repair its roots in that area, too. Then next year, slice the other side. Then dig up and move the root ball with top cut way back in the dormant season. In theory the process should work with the flowering almond but I am not familiar with that shrub. The rose you can do the same thing with - hyacinths, I have not been too impressed with their longevity - they get scraggly after a few years for me. For the rose - if it's an own-root variety, you can take cuttings and root them for a new one and then kill the old one (once you've successfully rooted the cuttings.) If its grafted, you'll need to find out if the variety is root hardy in your area. I will have to give the circle cutting a try. Thanks. I think it will be better for all plants if they are moved. I pruned the burning bush back this spring but wasn't sure how much pruning it could handle at the size it has gotten. It's around 5.5 ft tall right now. I buzzed about 4 inches off the top just to get it out of the pear. I don't know anything about roses. I haven't a clue what kind of rose is down there. Probably a knock out rose of some kind. Lady before me had a thing for knock outs. I'm a climbing rose person myself.